« Year-round Gardening: Organize Your Seeds! So this year, I pledge to grow an enormous amount of peas. Rows and rows of peas. Oh, and more rows of peas. We will grow our old standby varieties: Homesteader, Green Arrow and Sugar Snap. Great old fashioned varieties that are not only tried and true, but relatively easy to find on a seed rack wherever you buy seeds in the spring. But, as some of you know, that’s just not enough for me. No, I can’t seem to just be content with three varieties of garden fresh, naturally grown yummy peas. Being the ‘What Am I Missing Out On?’ kinda gal that I am, I just have to go on a Quest for the best growing, best producing, best tasting peas I can find for our climate. Little Marvel – a dwarf habit bush pea that produces lots of yummy snap pods of peas. This is an easy to find heritage variety that is quite popular. St. Hubert Soup – Grown by french settlers in Quebec, St. Hubert is a very productive and tasty soup pea variety that grows lots of peas on tall vines. Spring Blush Snap* – A tall snap pea whose pods have a purple blush! Can’t wait to try this one! Opal Creek Snap* – reportedly a cross between the old fashioned variety golden sweet and sugar snap. It has high reviews, so I’m excited to try it out. Kent Blue* – A tall variety producing beautiful flowers that start out blue, and turn pink before producing delicious edible podded peas. Based on numerous rave reviews of this variety, looks like it could become a favorite in 2011! 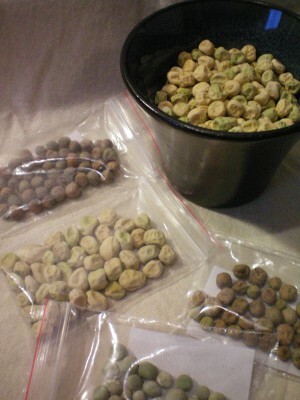 *Thanks Dan for your generous sharing of these pea varieties! So now, back to you: What are your favorite garden pea varieties?